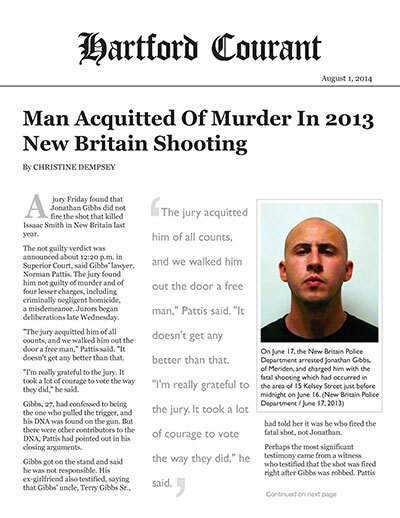 A jury Friday found that Jonathan Gibbs did not fire the shot that killed Issaac Smith in New Britain last year. The not guilty verdict was announced about 12:20 p.m. in Superior Court, said Gibbs' lawyer, Norman Pattis. The jury found him not guilty of murder and of four lesser charges, including criminally negligent homicide, a misdemeanor. Jurors began deliberations late Wednesday. "The jury acquitted him of all counts, and we walked him out the door a free man," Pattis said. "It doesn't get any better than that. "I'm really grateful to the jury. It took a lot of courage to vote the way they did," he said. Gibbs, 27, had confessed to being the one who pulled the trigger, and his DNA was found on the gun. But there were other contributors to the DNA, Pattis had pointed out in his closing arguments. Gibbs got on the stand and said he was not responsible. His ex-girlfriend also testified, saying that Gibbs' uncle, Terry Gibbs Sr., had told her it was he who fired the fatal shot, not Jonathan. Perhaps the most significant testimony came from a witness who testified that the shot was fired right after Gibbs was robbed. Pattis had argued that Gibbs wouldn't have had enough time to go to his truck and get his gun. "He lied to cover for his uncle," Pattis said. "I met this kid two days after he talked to the cops. I believed him then and I believe him now." When the uncle, Terry Gibbs Sr., took the stand out of the jury's presence, he invoked his Fifth amendment right against self-incrimination every time Pattis asked a question. He was not allowed to testify in front of the jury. Prosecutor Brian Preleski could not be reached for comment. The shooting happened at 19 Kelsey St. in New Britain late on June 16, 2013. According to the warrant for Gibbs' arrest, when police went to talk to him the next day, Gibbs asked why they were at his Meriden home. A detective said, "It's about what happened in New Britain last night," and Gibbs' response was, "Did I hit him?" In his written statement to police, Gibbs not only said that he had fired a gun but gave police a motive. He said he went to 19 Kelsey St. the night before to sell to someone he met on Facebook a pair of Nike sneakers he had purchased for $300. He had hoped to sell them for $400, he said. The buyer arrived, and Gibbs put the sneakers on the hood of his truck, he said. The buyer, a younger man, checked one out. The buyer "then lifted his shirt and gestured as if he had a gun," Gibbs told police, and Gibbs saw something "black in his waist area." The buyer then told Gibbs to turn around, which he did, according to the warrant. Gibbs then heard what sounded like the sounds of the younger man running away, the warrant says, so "I immediately reached into my truck and grabbed my Glock 19, which was on the seat." "I ran after the male who stole my sneakers, aimed at him as he was running away, and fired one shot from my firearm," he told police. "I had my sights on him but I decided to aim lower when I fired the shot. ... I didn't know he was hit by the gunfire." Smith had been shot in the back of the head.